Two-months later, the patient was readmitted with a 5-day history of progressive new right-sided weakness, sensory loss, receptive aphasia, and right homonymous hemianopia. Empirical high-dose daily IV methylprednisolone was started. A repeat MRI showed a new extensive pattern of T2 signal abnormality extending from the surgical cavity to deeper ipsilateral structures, including the internal capsule, thalamus, cerebral peduncle, and pons. There was only minimal mass effect and focal gadolinium enhancement, which did not surround the lesion (figure, C). MRI spectroscopy within the lesion showed an NAA/choline ratio of 0.42 with a lipid lactate peak suggestive of a nontumoral process, such as necrosis or inflammatory demyelination. The differential diagnosis however included CNS lymphoma and progressive multifocal leucoencephalopathy. Whole-body CT revealed a 5-cm para-aortic mass at the mid-lumbar level, suggestive of metastatic adenopathy. A core needle biopsy of the mass showed highly atypical cells with prominent nucleoli, staining positively for SALL4 and OCT3/4 and negatively for CD30. This was consistent with metastatic seminoma (figure). Testicular ultrasound revealed that the left testis had an irregular contour with areas of hypoechogenicity and calcifications. Orchiectomy histopathology confirmed extensive atrophy and focal fibrosis, suggestive of a “burned out” germ cell tumor. A dedicated pathologic re-examination of the brain failed to show any evidence of germ cell infiltration. The patient's serum and CSF were sent for cell-based assay testing of clinically relevant paraneoplastic antibodies (including anti-Ma2/Ta) and cell-surface neuronal, myelin, and astrocyte antibodies (including anti-aquaporin-4 and anti-MOG); all were negative. Further screening by immunofluorescence immunohistochemistry of rat brain sections and on live neuronal cultures did not reveal specific binding. The oncologic diagnosis was stage IIb seminoma, which was treated with radiotherapy to the para-aortic region. After bolus methylprednisolone, the patient was treated with a slow tapering course of oral steroids for the brain lesion. Ten months after initial symptomatic onset, he had marked improvement in visual and language deficits but persistent severe right hemiparesis, affecting the leg more than the arm. The last MRI showed overall marked improvement in the abnormal signal noted in the left temporal, parietal, and brainstem regions, with residual changes most prominently in the thalamus and splenium of the corpus callosum. 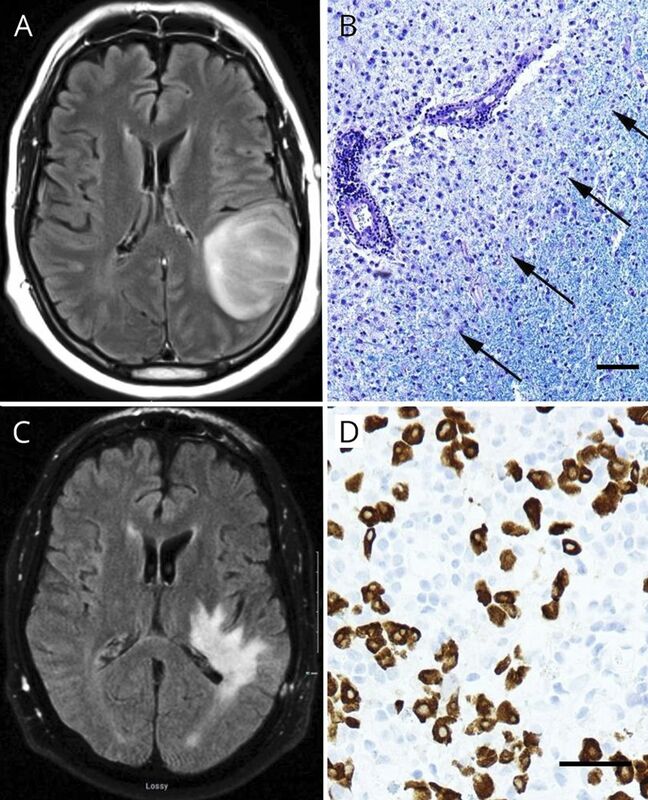 This is the fourth report of paraneoplastic tumefactive demyelination with seminoma,1,–,3 excluding 1 report in which autopsy showed definite additional intravascular seminoma.4 Although unrevealing, this is the first reported search for autoantibodies in a possible new paraneoplastic entity. In all 3 previous cases, the neurologic syndrome was the index manifestation and consisted of visual and memory deficits. MRI showed lesions restricted to occipital lobes and posterior corpus callosum. Two patients had permanent neurologic sequelae despite treatment with steroids and chemotherapy. Our case showed unique prominent unilateral spread of demyelination to subcortical structures including the thalamus and brainstem. Distinguishing tumefactive demyelination from glioma or lymphoma on imaging remains challenging. The following features may favor demyelination: incomplete rim enhancement, T2 hypointense rim, absent or mild mass effect, and minimal perilesional edema.5,6 This is also another example of “burned out” testicular seminoma,7 in which testicular imaging and biopsy may seem unrevealing, and metastatic germ cell tumor is only revealed by dedicated systemic imaging. Although seminomas mostly respond well to chemotherapy and radiotherapy, with favorable long-term survival rates, the occurrence of tumefactive demyelination seems to be associated with less favorable functional outcome. S. Thebault and I. Hanes report no disclosures; J. Woulfe received research support from the Canadian Institutes of Health Research and Partners Investing in Parkinson Research. P. Bourque reports no disclosures. Full disclosure form information provided by the authors is available with the full text of this article at Neurology.org/NN.
. Paraneoplastic tumefactive demyelination with underlying combined germ cell cancer. Pract Neurol 2015;15:451–455.
. Paraneoplastic demyelinating disorder in the brain of a patient with seminoma. J Comput Assist Tomogr 1998;22:136–138.
. Solitary focal demyelination in the brain as a paraneoplastic disorder. Med Pediatr Oncol 1996;26:111–115.
. Paraneoplastic syndrome simulating encephalitis in the course of testicular seminoma. Folia neuropathologica 1997;35:24–28.
. MRI findings in tumefactive demyelinating lesions: a systematic review and meta-analysis. AJNR Am J Neuroradiol 2018;39:1643–1649.
. Clinical and radiographic spectrum of pathologically confirmed tumefactive multiple sclerosis. Brain 2008;131:1759–1775.
. Two cases of retroperitoneal metastasis from a completely regressed burned-out testicular cancer. Urologia 2013;80:74–79.